Arnica montana flowers are infused in an olive oil base for at least one month. We make our Comfrey infused oil in small batches and add a touch of Vitamin E to guarantee freshness. 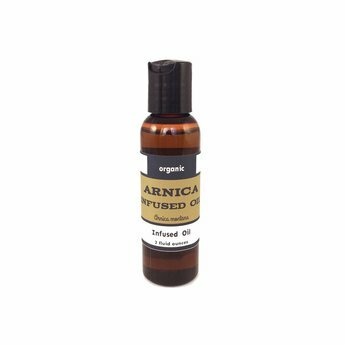 Arnica infused oil is the herbalists’ go-to tool for sore muscles and joints. It is a very effective anti-inflammatory and helps relieve pain and swelling associated with inflammation. It is one of the best applications for soreness after strenuous activities (like hiking, biking, and backpacking) and also for expediting the healing of bruises. This strong oil can be used as a stand-alone product, but is more commonly diluted with another carrier oil before application or used as an ingredient in a salve, lotion or balm. For external use only; can be very dangerous if taken internally. Do not use on open wounds.